Guarantee your compliance! Employers are responsible for protecting employees’ rights and ensuring posting compliance. 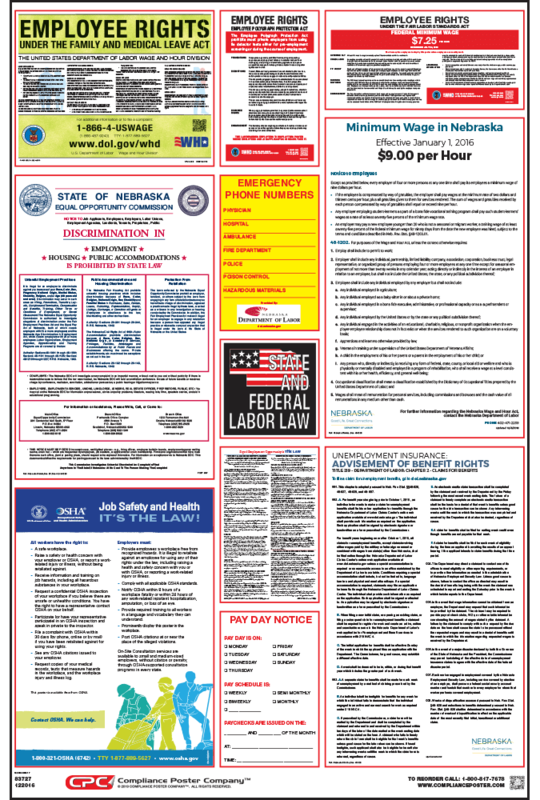 The Nebraska All-On-One™ Labor Law Poster fulfills all State, Federal and OSHA mandatory-to-post requirements for your workplace. Federal and State laws require employers to post notices informing employees of their rights and protections while performing work for their employers. 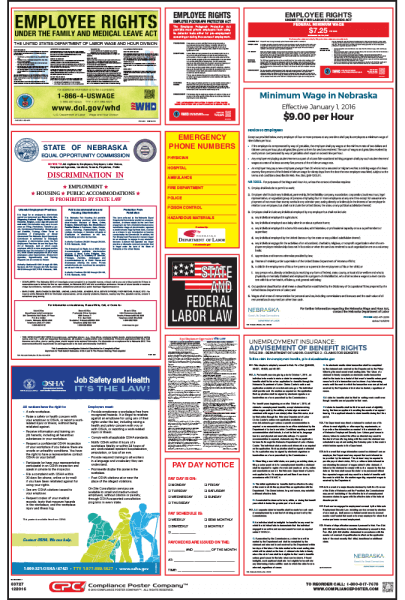 Nebraska Labor Law Posters contain each of the state and federal mandatory labor law notices that must be posted in the workplace. Employers may also be required to post a separate city or county poster depending on their location, or specialized posters relating to their industry. Minimum Wage (December 2016) – Updated with new design and text. 2015 rate removed from posting; definition of “occupational classification” added. Unemployment Insurance (December 2016) – Updated with new information on claimant rights and responsibilities, including claimant’s responsibility to register for work and create an active resume on the Nebraska DOL’s website. Nebraska No Smoking Poster: Nebraska law requires employers and proprietors to make reasonable efforts to deter smoking in workplaces and public places, which may include posting No Smoking signs on entrances. Search Nebraska products to find mandatory posters for specific industries.